The technology that you could only dream about in Medical School . 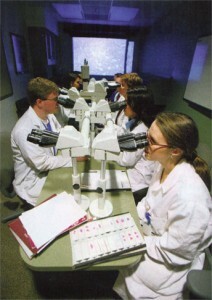 . .
Cytopathology is a branch of pathology that studies and diagnoses diseases on the cellular level. A common application of cytopathology is the Pap smear, used as a screening tool, to detect precancerous cervical lesions and prevent cervical cancer. Cytopathology is also commonly used to investigate thyroid lesions, diseases involving sterile body cavities (peritoneal, pleural, and cerebrospinal), and a wide range of other body sites. It is usually used to aid in the diagnosis of cancer, but also helps in the diagnosis of certain infectious diseases and other inflammatory conditions. Cytopathology is generally used on samples of free cells or tissue fragments, in contrast to histopathology, which studies whole tissues. RTIS™ allows rapid sharing of cytopathology samples between pathologists aiding in instant confirmation rather than having to wait hours or even days for results. Cytopathologic tests are sometimes called smear tests because the samples may be smeared across a glass microscope slide for subsequent staining and microscopic examination. Different types of smear tests may also be used for cancer diagnosis. RTIS™ allows for realtime consultation!